I’ve spoken about my friend, Paula, from Vintage Kitchen Notes, on my blog before. I guest posted for her with junk food bars when she was going through the grueling ordeal of dealing with devastating floods in her hometown of Buenos Aires. I can go on and on about what an amazing woman, friend, chef, baker and blogger she is and last week, she gave me even more to gush about. I was reading Paula’s blog and she had started a particular post by saying that she didn’t have much to say that day. I commented that I knew how she felt, that I hadn’t put together a post for last week and that I should probably schedule something for this week while I’m on holiday (I’m in San Francisco right now with the Husband and Abby). Within an hour, guess who emailed me directly to offer a guest post while I was away? Yup, that would be Paula. The same lady who is literally half a world away from me, who is smoking busy with her own blogs, dealing with the aftermath of the floods, working on her textile business, and everything else that life throws at her. Foodie friends are the best friends. I didn’t even ask for help but she recognized that I was in need of it. Without any hesitation, she offered her assistance and I’m so thankful that she did. So, without further ado, here is my dear friend Paula, with an incredible brown butter (swoon!) 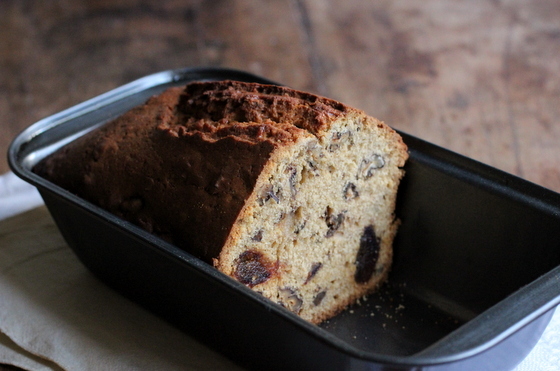 date and pecan loaf. I SO need to make this when I get back! Hey Gotta Get Baked readers! We meet again. What? You don’t remember me? Sure you do remember the decadent junk food magic bars, the guest post Nancy did for me some months ago, those sweet layers of whatever she found lying around in the kitchen, from pretzels to chocolate to condensed milk. Don’t worry, I’ll wait here while you go check them out… because you might be there a while and also check the peanut butter caramel corn or the lemon poppyseed layer cake. Let me start by introducing myself in the meantime. I’m Paula and I blog from Buenos Aires, a wonderful city in the southern hemisphere. A place where right now it’s winter, 50ºF, and cloudy. A perfect day to stay in the kitchen and bake this for you, and our girl Nancy who is doing nothing at all while enjoying a much deserved vacation. We agreed on this date and pecan loaf cake. 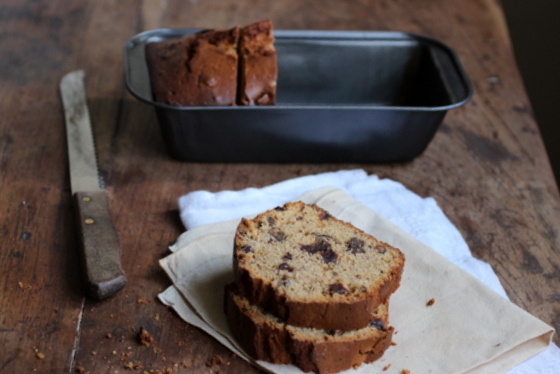 You say quick bread, I say loaf cake. Both work. And what works too are the flavors. The sweetness of plum medjool dates, one of my favorite things in the world, with toasted pecans and brown sugar. And brown butter. It deserves it’s own sentence. Who can argue with the nutty flavor of butter that is left to sizzle and toast? Not me, that’s for sure. I don’t understand why brown butter is not sold by the pound. This is the kind of thing you bake if your mother in law is coming over for tea. Or to take on a road trip. Or to have lying around in the kitchen for that afternoon cup of coffee. Or, like me, to have in the freezer and eat toasted. That’s my favorite way of eating it. A slathering of sweet butter while still warm doesn’t hurt either. We here are very fond of loaf cakes. Any flavor really. Though some are very traditional, like marbled, lemon and the english loaf. This last one is the base for the one I’m sharing today. It’s dense, sweet and has some kind of nuts and/or dried fruits. It’s the perfect companion for the 5 o’clock cup of tea, hence the name. We’re big on our tea, because we eat dinner at around 9pm. So a mid-afternoon snack is essential. What is your favorite bakery item for a snack? Though I love anything with butter and dulce de leche, mainly croissants filled with the latter, it’s a rare treat. If left to my own judgment it will be a poor one, especially when the sweet craving hits a few hours after lunch. So I try to have less extreme snack ideas ready to pop into the toaster oven and eat. Because me and my cup of coffee in the afternoon, we’re this close, best buddies. 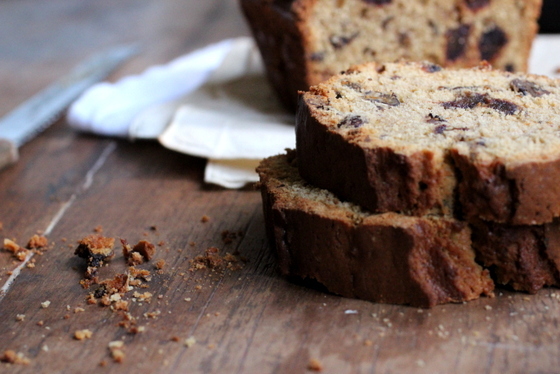 And a slice of brown butter date and pecan loaf puts a smile on my face. To make the brown butter, in a small saucepan melt the butter. Let it bubble and foam, until it starts turning a deep amber color, similar to caramel. This will take about 4 or 5 minutes. Don´t let it burn. Transfer to a small bowl and freeze for about 30 minutes, until solid but not rock-hard. Preheat oven to 350ºF. Grease a non-stick 8×4-inch loaf pan. Or line the bottom with parchment paper. In a large bowl, beat brown butter with sugar until very creamy, about 3 minutes. Add eggs, one at a time, beating well after each addition. Add molasses if using. Sift together flour, baking powder, salt, ginger, cinnamon and nutmeg. Add the dry ingredients to the butter mixture in 3 additions, alternating with the milk in two additions. Add the vanilla. Finally, add the dates and pecans with a spatula and mix well. It may look somewhat curdled, it’s fine. Bake for 45 minutes to 1 hour, until a tester comes out clean. Let cool on wire rack. Unmold and keep, well wrapped, at room tº for a few days, or freeze for a few months. Thank you so much, Paula! You’re an absolute angel for swooping in just when I needed you and offering this guest post. Your brown butter date and pecan loaf looks incredible – I mean, duh, it’s got the most magic of all baking ingredients: brown butter! I may not get to see your smiling faces every day, but you foodies are some of my closest gals. Paula is a nice lady, and she can bake! This bread looks wonderful. Enjoy your vaca! Paula and Nancy, LOVE this post and this BREAD. . OMG. . LOVE browned butter. . if you guys find any place that sells this, let me know! Paula, as always. . beautiful post, recipe and photos! Nancy, please please let me know if you ever need a guest post. . I am here for you sister! Hope you had a fabulous and restful time in CA. How was Abby on the plane? This loaf looks too delicious! Enjoy your holiday my friend! Looks delicious! I LOVE pecans. A great guest post and her photos are beautiful!! Going to check her blog, thanks Nancy! Yes to the molasses and nutmeg! And yes to taking a break from blogging and having vacation time with family! A scrumptious recipe and a stellar vacation! Nancy may live on the tippy top of North America & Paula may reside in the Southern hemisphere, but you both share the same claim to the title of fabulouso bakers. 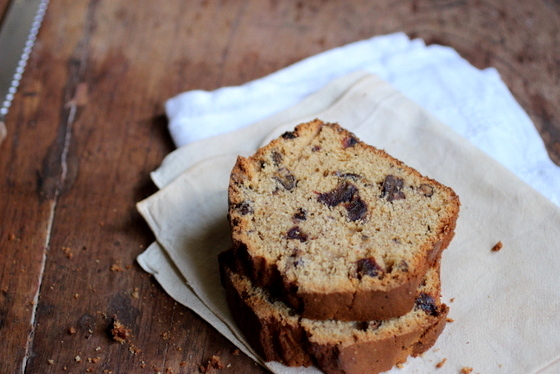 This pecan date quick bread may also be called cake loaf but in my mind it’s just plain ol’ delicious! This leaves me speechless. And not many things do that to me anymore. Sounds delicious! I love the flavor combinations here. Well done Paula and Nancy! 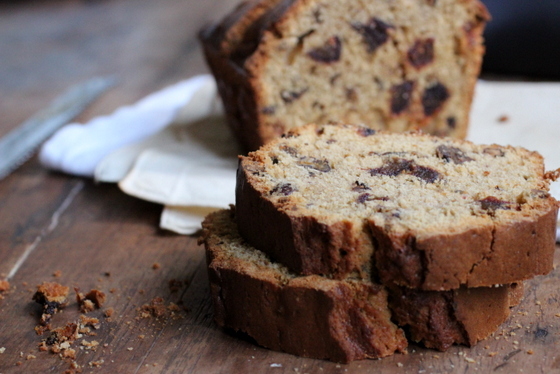 I cannot wait to try this… I love all the combinations you put into this bread…. way to go.. btw I really like your photo’s, they are making me hungry! I’m reading along and it come to the sentence “this is the kind of thing you bake when your mother-in-law…” and I thought it’s what I would bake for me, slice it up, and keep the slices in the freezer to bring out and toast for breakfast. I smiled when I saw Paula does the same thing. 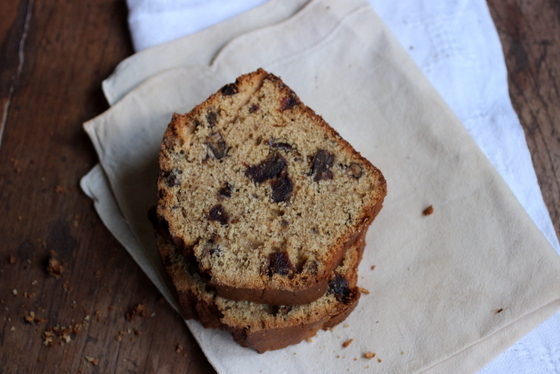 What a perfect quick bread, um, loaf cake, to go with coffee. Awesome loaf. Wish I could grab it to have it with my coffee right now. The best community of bloggers no doubt. You all made my day, and week, with your amazing comments! Thanks SO much to all and to you Nancy! Aw, isn’t Paula the best? What a marvelous bread. I’d even eat it right out of the freezer No will power with this sort of yumminess in the kitchen! Hope you had a blast on your holiday! Love this post! And the loaf looks gorgeous! What gorgeous bread!! Brown butter is the bomb.